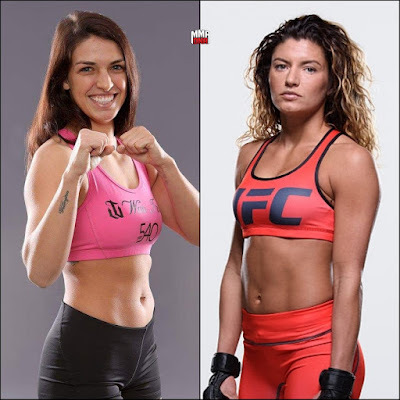 This morning Ariel Helwani of MMA Fighting reported that Mackenzie Dern vs Ashley Yoder has been added to UFC 222 Mar. 3 at the T-Mobile Arena in Las Vegas. Mackenzie is one of the most eagerly anticipated UFC signings in some time. Matchmaker Sean Shelby announced her signing on Saturday. So what's the big deal? Mackenzie is 24 years old from Phoenix. The big deal is she was a Brazilian Jiu Jitsu champ before turning pro. Her dad was a BJJ whiz too. She trains at MMA Lab in Phoenix which is owned by Bellator's Benson Henderson. John Crouch is her coach. Her record is 5-0. I just saw her dominate her opponent a couple of weeks ago in Invicta. Her striking looks to be much improved. It was just a matter of time before she signed with the UFC. The one question about her is can she make 115lb or should she fight at 125. She's big for a Strawweight so Mackenzie could dominate the division if she can make weight. And she has the looks to cross over to the mainstream and attract casual fans. She should ditch that phony Brazilian accent. Her opponent Ashley Yoder is not a UFC caliber fighter. She's 30 years old and trains at Team Quest in California. Her record is 5-3 and 0-2 in the UFC, She didn't look good in either of her UFC fights. I guess Mackenzie has to start somewhere.